Note: all multiple bedded sleeping rooms come with 2 double beds (not queen-size beds). To obtain these special room rates, a reservation must be made by June 19, 2008. To make a reservation online, please click here. There are a limited number of additional hotel rooms at the Hilton now available on July 19. Please call 206-695-6036 or 206-695-6027 to arrange for one of these rooms. 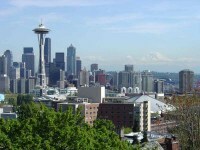 There is a bus that goes regularly from Seattle-Tacoma aiport (SEATAC) to downtown hotels, including the Hilton. Please consult the Downtown Airporter for more information. Last modified on Mar 26, 2008.